It is a sad fact that silent film stars are not as well-remembered now as they were then. A case in point, I think, is Douglas Fairbanks. Before sound took complete control, Fairbanks, along with his wife Mary Pickford, were the biggest stars in the world. Even after the introduction to sound, neither Fairbanks or Pickford should have faded away. Both had excellent voices and were trained on the stage. However, perhaps they were too tied with silent films to have the careers in sound they should have had. 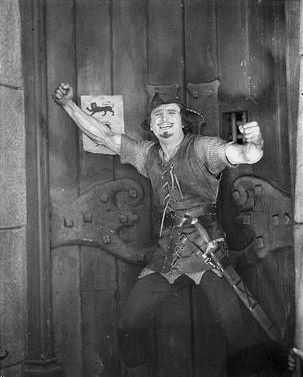 It would have been interesting to imagine Fairbanks recreate his Robin Hood in a sound film, since despite the popular idea that Errol Flynn made Robin Hood into the mirthful man of action, Flynn consciously or not owes a great deal to how Fairbanks played him. Robin Hood was a romp, with Fairbanks giving what can only be called a robust performance as our noble outlaw. King Richard the Lion-Heart (Wallace Beery) is going to go on Crusade. He appoints Robert, Earl of Huntington (Fairbanks) as his second-in-command. Huntington is a master jouster, general bon vivant, but unsure around women. However, His Majesty plays matchmaker, and the Earl soon finds himself in love with the fair Maid Marion (Enid Bennett). It's off to Crusade, but it was a poor decision, for the King's brother, Prince John (Sam De Grasse), along with his henchman Sir Guy of Gisbourne (Paul Dickey) have decided to take advantage of Richard's absence and steal everything that isn't nailed. Prince John, Sir Guy, and another henchman, the new High Sheriff of Nottingham (William Lowery) are making England not so Merry. In fact, they have made life miserable for the whole country, and in desperation Lady Marion contacts Huntington to return. Huntington fears that if Richard knew the extent of John's treachery, he would cancel the Crusade, which he does not want. He tries to get permission but the King thinks he wants to leave just to be with Marion. Attempting to go anyway, Sir Guy deceives the King and has Huntington and his valet locked up. Huntington and his valet, also known as Little John (Alan Hale), manage to escape from France and return to England, where they lead 'the Resistance' against 'Prince John's perfidery'. Using the nom de guerre of 'Robin Hood', this outlaw thwarts John and the Sheriff at every turn, soon joined by Friar Tuck (Willard Lewis), Will Scarlett (Bud Geary), and Alan-a-Dale (Lloyd Talman). The robbing of the Priory of St. Catherine proves fortuitous, as Robin discovers that Marion did not die falling off a cliff as her maidservant claimed. Instead, Marian and her handmaiden have been hiding out at the priory, and the lovers are briefly reunited. Things are going bad to worse for John. First, Robin Hood is out there causing him nothing but trouble. Next, Marion is still alive. Worse but unbeknown to him, the Crusades are over and Richard not only is coming back but has learned the full extent of his brother's evil. He also discovers that Sir Guy attempted to assassinate him, but Sir Guy is wrong when he reports to John that Richard is dead. He had accidentally killed the Court Jester who was lying in Richard's bed. Prince John's men retake Lady Marion, and Robin Hood races from the captured Nottingham to make a daring rescue, culminating in an epic battle which has a most happy ending. I think if one looked at Fairbanks' performance as Robin Hood, a lot of people nowadays might find it bordering on laughable. All that laughter, all that arm thrusting: I think the words 'boisterous' and 'enthusiastic' would be the best descriptors of when Fairbanks was Robin Hood. I think it might look exaggerated, even silly through today's eyes, but I think Fairbanks was showing that as Robin Hood, he was full of life and fun, but using that as a way of masking the deep hurt he had at the loss of Marion. The title cards I think read to say that he was full of fun, but a bitter grief too. Putting aside the enthusiasm Fairbanks showed, Robin Hood also showcases that he had a great flair for wry humor and touching drama as well. Early on, his clumsiness and fear of women was played for gentle laughs, culminating with him plunging into a moat to get away from his many female fans only to find himself facing a washerwoman. "Another woman!" he says as he swims away. The reunion between Robin and Marion, while extremely brief, showed a softer, gentler side to Fairbanks, and it is beautifully shot. Credit to cinematographers Arthur Edeson and Charles Richardson, along with director Allan Dwan for creating some beautiful cinematic moments. There's the aforementioned reunion, then there's the almost Expressionistic assassination attempt. One particular moment that should be mentioned is when we see the effects of Prince John's tyranny. We see surprisingly graphic images of dead men strung high up, with an old couple looking up in agony. It's clear just by the images that the old couple are the parents of the dead man, killed by Prince John's men for unknown reasons, their agony palpable. This is a rare moment however, as most of Robin Hood is lavish and extravagant. From the opening joust match to the grandness of the sets and costumes, this film version of the legendary stories was full of life and vigor. The mind does boggle a bit to think Wallace Beery could yuck it up as a more merry monarch, complete with pageboy hair, but Beery was quite entertaining as our mostly jolly Richard. De Grasse was cool and appropriately wicked as Prince John, and Bennett was a typical 'damsel-in-distress', a bit fluttery for my taste. Fairbanks, if nothing else, showcases his legendary athleticism in Robin Hood, making elaborate leaps that still astonish today, nearly a century later. It was much part of his persona that Will Rogers, legendary comic and wit, made a spoof of Fairbanks and Robin Hood in a 1923 short, Big Moments From Little Pictures. The original release included a six minute intermission, part of the reason why Robin Hood over two hours long. The length, plus Fairbanks' perhaps overenthusiasm as Robin Hood might be an issue watching the film today. Still, on the whole Robin Hood has some wonderful moments of action, romance, and comedy, with a rousing performance by Douglas Fairbanks and great visuals that still attest to the power of our legendary outlaw's enduring popularity.